Although these are really useful in the real world, not everyone is a fan of numbers and equations. Once you left high school you probably thought you were never going to come across math ever again. Well, think again. A tricky math problem has gone viral online and people are going crazy over it. This isn’t like the standard question on your 7th grade math test, it’s more of a brain teaser. 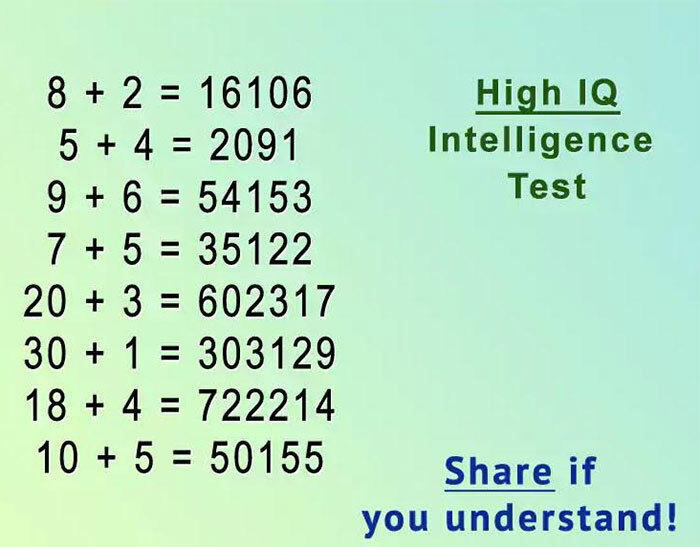 Do you think you can figure it out? Before we give you the question, we just want to give you a heads up of what you’re getting yourself into. This isn’t a regular arithmetic question. This is the ‘math test’ that is going viral online. As you can see, the answers are totally wrong. 8 + 2 = 16106!? We all know that 8 + 2 = 10… right? But it looks like ALL of the answers follow the same pattern. Like we mentioned before, this is going to take a bit of thinking. This is going to require you to think outside the box. This one is going to require a little bit of brainpower. But lucky for you, we will give you a hint. Go back to your elementary days and focus on the basics like addition, subtraction, and multiplication. Still not getting it? Look for patterns. Don’t look at the answer as a whole. Look at it in parts and sections. And finally, the answer! 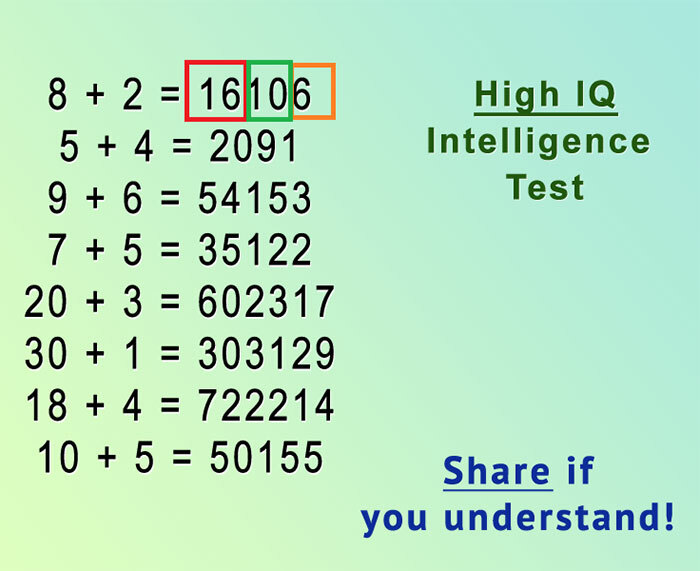 The first part of the answer is the product of the numbers. The middle section is the sum. And the last section is the difference. For those that managed to get it without help, congrats! And as for those that didn’t, well at least you tried.